NsukkaUSA Inc. is a socio-cultural organization comprising Nsukka citizens living in the United States of America. Part of her continuous socio-economic empowerment program is the award of Financial Aid and Academic Excellence to students from any of the 7 L.G.A.’s namely, Igbo-Etiti, Igbo-Eze North, Igbo-Eze South, Isi-Uzo, Nsukka, Udenu and Uzo-Uwani, whose department of study is at the Nsukka campus of the University of Nigeria, Nsukka. (a) Students enrolled at the University of Nigeria in degree programs at Nsukka campus only and who are in the final year of their study during the 2018/2019 session. (b) Students whose town of origin is any of the above named 7 Local Government Areas. (D) Students who are of excellent academic standing with verifiable CGPA. 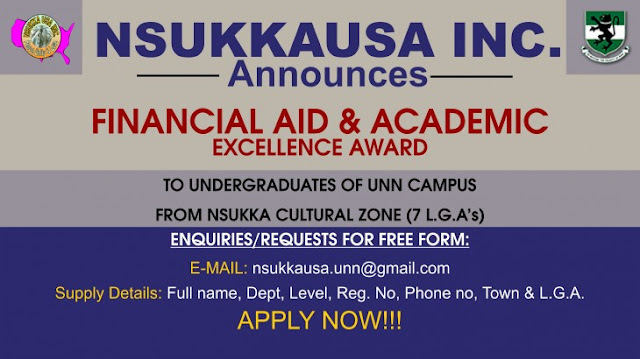 Eligible candidates should send a mail to “nsukkausa.unn@gmail.com” requesting for the form, stating their Full names, Department, Registration no. ,Local Government Area, Town & Phone number. Upon completion of an Online form, a form will be mailed to the candidate to download and print. Completed application form and enclosures shall be addressed to the Award Co-ordinator and submitted in the designated box at the General Office of the Department of Geology. NOTE: The Application Form is free. Only e-mail enquiries are advised. Online e-mail requests for Application Form shall end by 22nd February, 2019, while completed application form and the enclosures shall be returned to the Award Committee not later than 30th February, 2019, or as may be stated on the Application Form.